Few meals are more satisfying than a hearty tagine–the rich, fragrant Moroccan stew that is served from its own elegant cooking vessel, also called a tagine. Meat, poultry, fish, or vegetables are simmered gently in the steam of the pot’s conical lid, and the food, deliciously flavored with spices and fruit, remains tender and moist. In Ghillie Basan’s collection of aromatic tagines you will find some of the best-loved classics of the Moroccan kitchen, such as Lamb Tagine with Prunes, Apricots, and Almonds, and the tangy Chicken Tagine with Green Olives and Lemon. 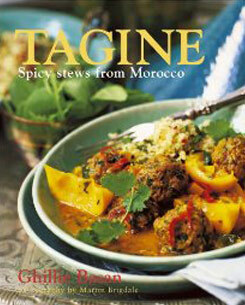 Also included are less traditional but equally delectable recipes for beef and meatball tagines. If you enjoy a succulent fish dish, you can try Monkfish Tagine with Potatoes, Cherry Tomatoes, and Olives, or Red Mullet with Lemon and Mint. For vegetarians there is a varied choice, from a sweet, syrupy tagine of Yams, Carrots, and Prunes to a summery dish of Artichoke Hearts with Peas and Saffron. *Every recipe includes suggestions for accompaniments and side dishes. *The perfect introduction to the distinctive tastes of Morocco.